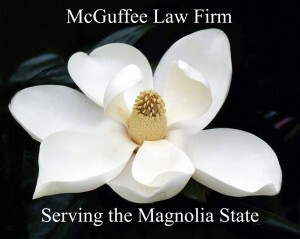 Serving clients throughout Mississippi, McGuffee Law Firm has a reputation for cost-effective representation combined with exceptional results. When you retain our services you will be represented by a Mississippi attorney with many years of experience. Dedicated to the client, McGuffee Law Firm engages in a general civil law and trial practice in the state and federal courts of Mississippi. McGuffee Law Firm performs its services with excellence and integrity, and maintains the highest ethical standards. If we are not able to help you with your situation, then we will place you in contact with a professional who can. Our staff wants you to know that we value your individual needs and that customer satisfaction is a vital part of how we do business. We look forward to serving you!